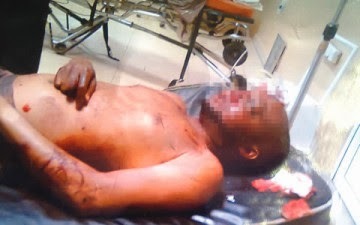 Saheed Waliu, the 28-year-old, who was in a coma five months after being allegedly brutalised by some policemen, is dead.Waliu was said to have given up the ghost at about 9am last Sunday at the Lagos State University Teaching Hospital, Ikeja, Lagos. PUNCH Metro had on October 10, 2013, reported that Waliu was hospitalised at LASUTH, after suffering a brutal attack from yet-to-be identified policemen attached to the Highway patrol, along the LASU-Igando Road on May 8, 2013.He was reportedly on his way home with a friend, Sherif Eleda, when the incident occurred. Waliu’s aged mother had told PUNCH Metro that the policemen had thrown an iron rod at Waliu, causing him to fall from his bike.He was said to have suffered a cracked skull and a broken leg in the process.No formal complaint was made at the nearest police station to the scene of the incident. Waliu’s family at the time, were said to be more preoccupied with how to save his life. He was buried on Tuesday according to Muslim rites.